“That is news.” Larry shrugged. Larry was basically too polite to accuse his guests of being shameless liars. It was probably why Ross Perot liked him so much. For me, the book was at its best—and funniest—in scenes like this, ones that you can just about believe. I got a lot of laughs out of the scenes when Nick and his friends from the tobacco and gun lobbies (they call themselves the MOD Squad—for Merchants of Death) discuss PR tactics. As the book goes on, the story gets crazier and crazier. There’s a car chase, a kidnapping, a forced overdose on nicotine patches, and more, but the wildest incidents never quite touch these moments when you get to see just how easy it can be to manipulate the media. Aaron Eckhart played Nick in the 2005 movie version of this book, which is every bit as good as the novel. In fact, I must admit that I’m not sure how well I would have liked this book had I not been so clearly able to picture Eckhart’s charming smile. He captured the part beautifully and made it possible for me to see how people could be won over by someone who is so clearly a complete sleaze. If you like outrageous satire, I recommend them both. 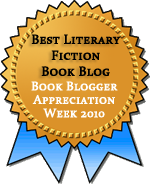 This entry was posted in Contemporary, Fiction, Giveaways. Bookmark the permalink. I had no idea that this was a book… and I thought the movie was great and very clever, and definitely outrageous. Thanks for the review! KimN: I wasn’t aware of the book until the movie came out. The plot goes in some different directions, but the overall tone is very much the same. I also had no idea this was a book. I liked the movie a lot — Aaron Eckhart is one of my favorite actors. I’m going to be on the lookout for this one now, thanks! Kim: I like Aaron Eckhart a lot too. I can’t imagine anyone else pulling off this part quite so well!